And we open with a fight, Ichabod fighting in the Revolutionary war, doing lots of killing and leading his men and looking for magical Hessians when he gets a report that the imprisoned Abbie wants to speak to him. She’s been smart enough to seed her demand with some clues on his mission so he would know it’s important. Meanwhile evil Katrina is in the infirmary looking for Ichabod – when she hears that Abbie has called him away from the battle. Ichabod takes Abbie to the aftermath where Abbie continues to tell him all about the obvious signs of the horseman (in between handing out some basic medical knowledge). She continues to slam him with knowledge and then hits him with the time travel whammy and realising that, by taking Ichabod from the battlefield and his confrontation with the horseman, she’s just changed history. Over to evil Katrina finding the not-yet-headless horseman who is looking for Ichabod to slice and dice. She wants to recruit him in her quest to kill Ichabod and Abbie, yes she’s gone full on evil. I do hope Abbie kills her. She kills a random soldier with magic to ensure they’re not overheard. Yes she has competent magic while evil too; if she were still good that much power would make her faint and Abbie eye-roll at least once. Back to our protagonists with Abbie pointing out which historic buildings will become Starbucks (all of them). And she scandalises the locals by wearing trousers. Thankfully, Franklin is very eager to receive them – as Ichabod said before, he’s a shameless self-promoter and horribly vain and Abbie can tell him lots of things about how remembered he is and how many of his ideas are implemented. It also helps that he has heard of the grand grimoire and the power it had, including time travel. When she and Franklin are alone, she reveals that the witch out to kill them is Katrina and Franklin reveals the plan they must have – reverse the time travel spell which, in turn, will reverse everything Abbie did. For that they need to consult an expert; Grace Dixon, Abbie’s ancestor. She also wants to tell Ichabod the truth, because she and Ichabod have learned the cost of secrets, but Franklin vetoes it. Ichabod goes home to his wife who greets him with smiles and telekinesis knives. Oh and an open magic book on the table. He’s saved from being stabbed (Katrina has forgotten her death bolts, apparently) by troops arriving to summon him to see Washington. Before going to Washington he checks through Abbie’s things (the quality of the printing on her cards alone should have raised eyebrows) and finds her phone. Revolutionary Ichabod and a phone will never not be hilarious. He finds his way to Abbie’s pictures and a video of himself with her. They travel to Abbie’s ancestor while on the way Abbie is nice enough to say that Katrina was once a good person (and she resists SO MUCH SNARK) but new Katrina is evil. Speaking of, Katrina uses magic to track where Abbie and Ichabod are going, then kills the commander. To Frederick’s Manor and Abbie greeting her ancestor with lots of nerves and a little awe. Grace recognises Abbie as a Witness. She does have a spell to reverse the time travel – but it will take down the wards that protect the house at the same time. They cast it while Abbie praises her ancestor for the legacy she left for them. Ichabod kills Katrina to save Abbie. Of course, Ichabod still tearfully holds her dying body as Henry’s ghost arrives to collect her (and take them both to purgatory I hope). When she dies, Katrina dissolves to ash. They’re joined by Jenny and Frank – and Frank isn’t evil any more after Henry’s death. Our main four characters are back. Abbie adds that Grace told her that major battles are still ahead – and again makes a pledge of unity of the four of them. Time travel, especially with marginalised people was always fraught. Abbie faced racism and assumptions of her being a slave which I would expect from the time but it did feel very… sanitised. The most overt racists were also cast as villains, but Franklin and Ichabod didn’t even pause nor take any issue to how she spoke. This is a season finale and it is no secret that we don’t think this has been great for Sleepy Hollow. As we’ve discussed, the treatment of the POC on this show has gone so downhill in a way that would be questionable on any show, but is downright tragic on a show that established itself by having so many prominent POC leads in the first season. It is a #cranewreck and it is damn sad – the only heartening moment was the ferocious reaction of fandom. The more recent attempts to try and pull that back were just… far too little, far too late. On top of that we had Katrina… a character so awful her name may actually become a new curse word. We have spoken at length and with great fury about this character, inept, weak, constantly forcing ridiculous decisions on the rest of the cast and generally being almost comically awful. Her prominence, coupled with the reduction of the presence of Abbie and Jenny meant this season wasn’t great for female characters either. The season did introduce the show’s very first gay character – a nameless lesbian who died minutes after her arrival. Ok, back to erasure, please. Macey, a disabled character, has also been absent. 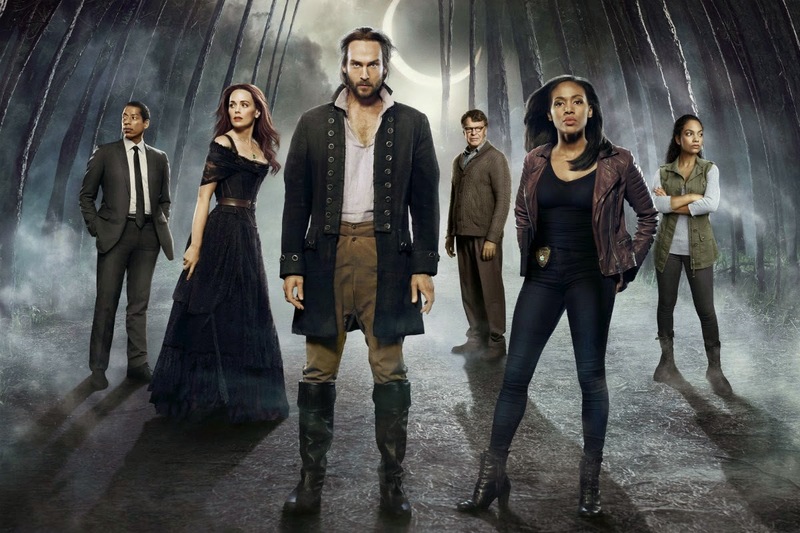 Even aside from the terrible inclusion of this series, the plot has been bad even by Sleepy Hollow’s genuinely ridiculous plot line. It has been overwhelmed by ridiculous amount of Crane romance drama that torpedoed any attempt at plot. But there wasn’t much attempt. We started with Henry as the horseman of war, but while he threw random things at the Witnesses they didn’t do a whole lot to stop him, just reacting and, in the end, Henry wasn’t defeated by them but by his own epic daddy issues which was singularly unsatisfactory. After that we’ve had a series of just plain odd plotettes – and what’s most frustrating about them is some of them could have developed into some serious storylines or good new characters (as opposed to Hawley). Disgruntled hot angel who was going to judge everyone for not reaching his hot high standards while also being exceedingly hot (not that I’m shallow)? Yes, go with that… but no it ended. Or the reported who was trying to find the truth? Nope, all done. The secret library of hidden knowledge and holographic founding fathers? Nope, exploded. Why are we scattering these little plot hooks all over the place without following any of them up? Even the escaping horseman of death just went on holiday or something!